Our Lady of Perpetual Help Radio is in the midst of a $30,000 fundraising campaign to purchase a 250 watt FM translator license. This would allow us to increase the area that we currently cover with our 100 watt low power FM (LPFM) station. We currently cover approximately an 8 mile radius. 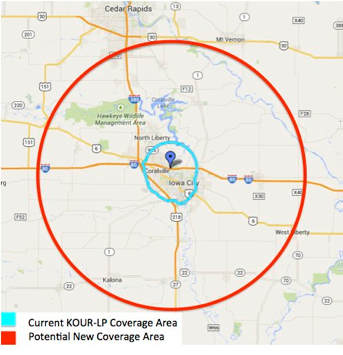 An FM translator license would allow us to increase our coverage area to approximately a 20 mile radius. This would enable us to better to serve you with a stronger signal and larger listening area. Have you been blessed by Catholic radio over the past 10 years? Please prayerfully consider partnering with us by donating now. Checks can be made payable to “Our Lady of Perpetual Help Radio,” 511 Iowa Ave., Iowa City, IA 52240. You can also make a secure donation online. THANK YOU!